Please do not attach large images, pdfs or other documents to the email. They will not be opened or reviewed. All work will be credited to the artist with a link to their website. (Please note that no payment will be made for the feature of artwork on our site). Unfortunately, we are unable to accept submissions based on KickStarter or other crowdfunding Campaigns. We accept exhibition press releases from galleries and artists by email. 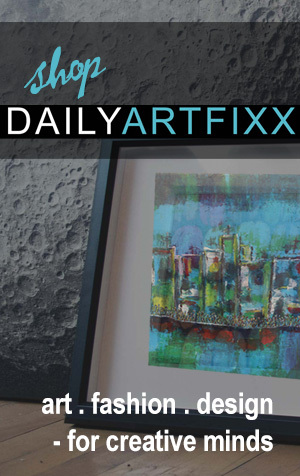 Requests for coverage can be sent to submissions@dailyartfixx.com . Please do not attach large images, pdfs or other documents to the email. They will not be opened or reviewed. Small embedded images (such as in an enewsletter format) are acceptable. Proposals can be sent to submissions@dailyartfixx.com . Please be familiar with the style and type of content Daily Art Fixx offers before submitting a guest writer proposal. Please do not attach large images, pdfs or other documents to the email. They will not be opened or reviewed. Small embedded images (such as in an enewsletter) are acceptable. We receive many submissions every week and unfortunately can only respond to those artists who are selected to be featured.